I noticed the other day I only have 78% of WZ acheivements so I decided to make a forum post about stalling to get it to 79%. If you are a fellow anti staller like myself you will be outraged by Captain Trips stalling for rank 222. Clearly something must be done about this, and because desperate times call for desperate measures, Fizzer has set up an ethics panel to punish anyone who Platinum has accused of stalling. The following people are on the panel: Xenophon, Platinum, Edge, Rento, JV and Master Shinra. All panellists are upstanding community members, who have never stalled, cheated, trolled or abused another player. We aim to give a voice to voiceless casuals like [ZBEK/44] San-Sayan, who was so enraged by Captain Trips' stalling that he refused to say anything in chat, and carried on like Trips' play speed wasn't an issue, when we all know he probably lost hours of sleep over it. If you won a gold trophy by stalling you will have to join either Lynx or GG (it's up to the staller to decide). If you took more than 22 hours to commit a turn or turns in any game, like my man Ralph the Unicorn and then lost, you will use this phrase as your tagline "I'm a staller" so upstanding community members like myself will know to steer clear of you. Can I get forum post too. 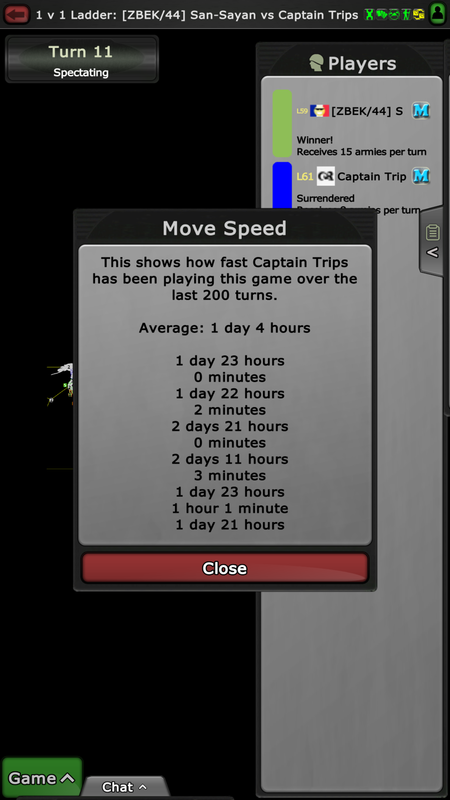 Well, looks like I stalled against the notorious staller Captain Trips. How about taking up sports? Is creating a forum post an achievement?